The first day of school . . .
My girls are grumpily preparing themselves for a new year, as I imagine many teens are across San Francisco tonight. One went out and spent her own money (summer earnings) on just the right school supplies for the first day. The other went with me to the bookstore and picked out some novels for her upcoming coursework (she said she is tired of electronics!). They’re feeling jittery, and excited too — my oldest daughter will graduate next spring and it’s kind of amazing to realize that when I first ran for the school board they were in 2nd and 3rd grade. And here we are in the last two years of high school. It goes fast, parents, and yet there is something so fresh and open and new about The First Day of School. The slate is clean, the possibilities are endless, and there is so much to do and learn. It’s been fun to see Facebook posts from my teacher and administrator friends this past week. I think teachers feel the same sense of anticipation as they set up their classrooms and get ready for students. Administrators have been back for a few weeks, working through their budgets and master schedules, dealing with facility issues and a million other details. There was a massive district-wide professional development to assist administrators and teachers with alternatives to suspension and referrals for behavior challenges– almost 1,000 educators participated. Let’s also acknowledge that it’s been a real slog to hire teachers for all the vacancies that exist. Many principals I know spent the last few weeks in nonstop interviews, and they did a great job (Sam Bass at Burton HS, I’m looking at you!! 100% filled!). Still, there are some classroom vacancies. As of Friday, the Board was told that there were 39 classroom vacancies, compared to 3 at this time last year. Overall, the district had 928 vacancies to fill for this school year, compared to 894 last year. Of the 39 classroom vacancies that exist district-wide, half are in our hard-to-fill subject areas, including 12 Special Education vacancies, 6 in Science/Math, and 3 Bilingual vacancies. There is a coverage plan, and central office staff (mostly teachers on special assignment) will fill vacancies on the first day and until we can either fill vacant positions with permanent hires or long-term substitutes. Not ideal, not what anyone wants, but this is where we are. I don’t want to end on a downer, because the positives do outweigh the negatives. Tomorrow we start a new year. What do you want for your kids in this next school year? Teachers, what do you want to accomplish this year? As a Board member, what I want to accomplish this school year comes down to support and implementation of initiatives we already have under way. The Superintendent’s departure for Houston gives us an opportunity to pause, take a deep breath, look at where we are and decide where we need to go. We need to figure out a better teacher recruitment and retention strategy that includes compensation increases, and design a Superintendent search process that is inclusive of many community perspectives (the Board will begin this discussion on Tuesday evening at our Committee of the Whole — you can either attend the meeting or listen to a recording that I’ll post once it’s up). We also need to decide what we want in a new district leader — what qualities should we as a community prioritize? Anyway, I wish everyone — students, educators, parents — a great first day of school tomorrow. Here we go! I have heard from many constituents regarding UESF’s grievance with the school district on the implementation schedule of wage increases agreed-upon as part of the three-year contract expiring June 30, 2017. We are all so deeply grateful for the powerful and critically important work our teachers, counselors, paraprofessionals, and other UESF members do every day for our students. That is why I wanted to take this opportunity to share some great news with all of you, even though it directly impacts only UESF members. SFUSD and UESF have reached an agreement today to move the original January 2017 raise to the beginning of the 2016-2017 school year. Given this decision, every UESF member will receive a 5% raise at the start of the school year, effectively moving the planned second salary increment of 2.25% up by six (6) months. The raises will be implemented in the first paycheck of the school year for all UESF members, both classified and certificated. Originally, the contract called for a 2.75% raise for the pay period starting in July 2016 and a 2.25% raise for the pay period starting in January 2017.
. . . The agreement effectively settles the existing grievances related to the timing of the second salary increment to the mutual satisfaction of both the Union and the District. As the school year comes to a close, SFUSD was able to find cost savings and wanted to contribute these savings to as many employees’ salaries as possible. This agreement will, in effect, result in 6 more months of increased salaries than previously planned. We know this is a challenging time to afford living in the Bay Area. The staggered pay schedule that has been in effect for more than 20 years resulted in confusion this winter as some UESF employees received their raises in January and some in February. Unfortunately, this placed added stress on those teachers who thought they would see their increase earlier in the calendar year. In addition to helping our valued current UESF members start next school year with a higher base salary, we hope this pay increase acceleration will also help us address our projected recruitment challenge due to the national teacher shortage. Higher bottom line salaries for UESF members starting in July 2016 will hopefully entice more teacher candidates and others as they explore their options. Know a great teacher or principal? Posted on January 29, 2016 by rpnorton | Comments Off on Know a great teacher or principal? Awardees receive wonderful donated gifts like laptops, hotel stays, event tickets and spa days, but the most important thing they receive is high-level recognition and gratitude for the incredible efforts they put in every day. Nominate every teacher or principal who has made a difference in your life or your child’s life — you don’t have to limit yourself to just one in either category! Teachers and principals who do great work in our schools every day deserve our thanks and recognition and this is one tangible way to offer it. Comments Off on Know a great teacher or principal? Let’s celebrate inclusive schools week! Posted on December 1, 2014 by rpnorton | Comments Off on Let’s celebrate inclusive schools week! Every year, the first week of December is Inclusive Schools Week. More than anything else, Inclusive Schools Week is about inspiring all of us to think bigger about who we are, which students our schools serve, and how we can serve every student better. Including Samuel is a documentary made by a photojournalist whose second son, Samuel, was born with a disability. Samuel’s family believes strongly he should be included in mainstream classrooms, but they also understand the trade-offs that full inclusion can require. Harper’s Playground came to be after Harper’s parents learned they would be parents of a child with a disability. They immediately wondered: how would they help Harper play with other children and find friends? From that, a movement toward more inclusive play spaces for children was born. Comments Off on Let’s celebrate inclusive schools week! At tonight’s meeting we heard a fascinating presentation of the results of the district’s research partnership with Stanford. Specifically, the partnership has looked at longitudinal data on English Learner achievement in several pathways — English Plus, Bilingual/biliteracy and Dual Immersion (full descriptions of each of these pathways are here). I’ll post the presentation as soon as I have an electronic copy, and it’s pretty straightforward to understand. But basically, our concern as a district has been that we didn’t have solid data supporting the big investment we’ve made in dual-language immersion as a strategy to support the achievement of English Learners. (And in addition, until the last two years, we didn’t have accurate data on the English proficiency/background of all the students enrolled in our language pathways). Dual-language immersion–offered in Spanish, Cantonese, Mandarin and Korean– is wildly popular among English speakers and was designed to support both the English language instructional needs of target language native speakers as well as their content instruction needs. These programs have exploded throughout the district and have been one of the district’s key strategies over the past decade for integrating schools (look at Bret Harte, Fairmount, Monroe, James Lick, DeAvila . . . the list goes on). There is some data — not unique to our district — indicating that English Learners who are educated in dual-language classrooms (the ideal ratio is debated but generally held to be 2/3 English Learner/bilingual with 1/3 English native speakers) are slightly more likely to be reclassified English proficient by middle school than English learners educated in other environments. Still, the sample sizes of the existing studies are small and the data they generated hasn’t been regarded as definitive (though to be fair it is considered “promising”). But the Stanford longitudinal results are much more robust and definitive than past studies, and I have to say that I was relieved when I saw that they basically support the earlier studies and our general approach up till now. Essentially: students in English Plus programs (where they are immersed in content instruction in English much of the day and pulled out for specific English Language Development for a certain number of minutes per day) become English proficient faster and achieve at a higher level in the earlier grades, but students in Bilingual and Dual-immersion pathways eventually catch up by middle school. The takeaway is that it doesn’t really matter what pathway you’re in by the time you reach middle school. The down side is that there is still a significant gap in achievement and overall English proficiency between students whose first language is Spanish and those whose first language is Chinese (Cantonese or Mandarin). And an additional down side is that all students — whether their first language is English, Chinese or Spanish — are not achieving at an acceptable level in math by middle school. So we have a lot of work to do. We celebrated 33 teachers who achieved the rigorous National Board Certification this year — bringing the number of district teachers who have achieved this professional honor and badge of achievement to 239! Congratulations! 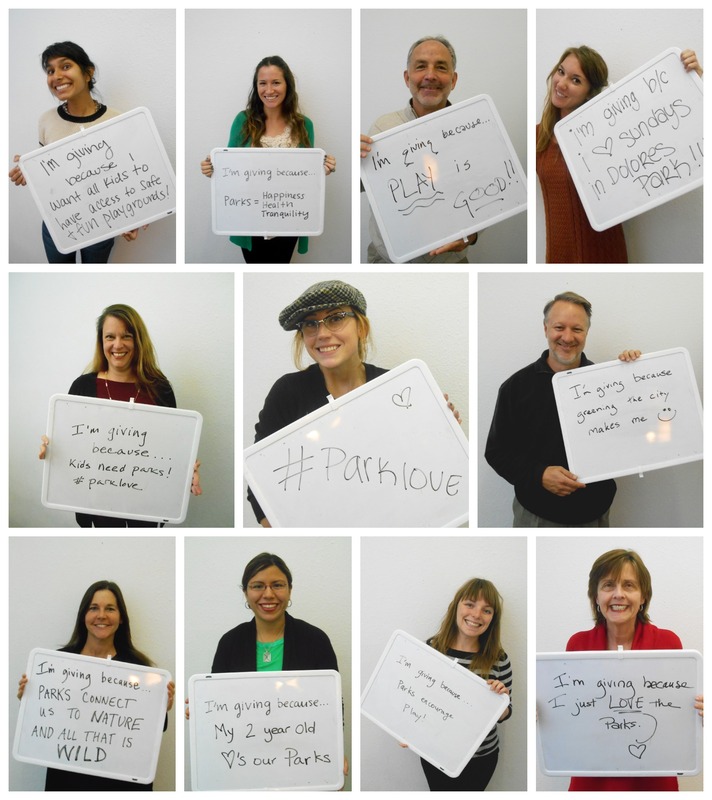 I gave $25 towards the San Francisco Parks Alliance’s Giving Tuesday goal to raise $2,000 for its Action Grant program. The Parks Alliance launched Action Grants last spring, donating a total of $25,000 to promising park projects that needed some “seed money” to get off the ground. My favorite, the Northridge Community Garden, was started by Mishwa Lee, a school district retiree and sometime substitute paraprofessional. Mishwa and her fellow Northridge residents have built an amazing garden and gathering space in their Bayview housing complex — producing food, community and youth development opportunities for all residents. The Arc’s holiday giving drive provides $25 gift cards to their clients who might not otherwise get any gift this year. These are just my suggestions for making a gift — of whatever size — this Giving Tuesday. Give to whatever cause is most meaningful to you today – it feels amazing! If you live in San Francisco, a revolution is coming to a school cafeteria near you . . . Revolution Foods, that is. 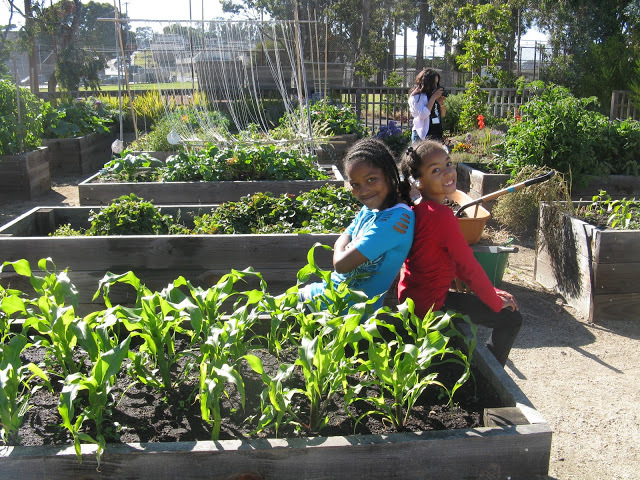 Tonight, the Board voted unanimously (6-0, with Commissioner Mendoza absent) to award Oakland-based Revolution Foods with an 18-month contract worth $13.5 million to provide pre-cooked, pre-plated fresh meals (mostly breakfasts and lunches) to students in SFUSD. The contract represents a shift in attitude towards student nutrition. It calls for fresh, not frozen entrees, and specifies that meals must be served to students within 24 hours of being prepared. If you accept (which I do) that fresh food = higher quality, then this requirement should bring about a huge improvement in the appeal of meals served to students. In many districts, improving the quality of meals has led to modest improvements in participation. What I hope is that this step will begin a “virtuous cycle” of increasing participation leading to better financial stability for the food program leading to better quality leading to even higher participation. The contract also represents an increased financial commitment to school meals in San Francisco. District officials told the Board that the school district is paying its current vendor $1.79 per lunch for elementary school students (up from the $1.59 per elementary lunch the district paid in 2011-12). Revolution’s bid for the new contract came to $1.95 per elementary lunch. Revolution was also the lowest bidder. The current vendor, Preferred Meal Systems of Illinois, bid $2.26 per elementary lunch for the same terms. Still, the bottom line is that the district will now be paying more per meal than it has in the past. In my reasoning (and one of the reasons I supported the new contract), we also will get more for our money. Finally, the contract also represents a huge increase in Revolution’s daily meal production in Northern California — according to co-founder and Chief Innovation Officer Kirsten Tobey, the company is currently producing 33,000 lunches a day in its Oakland kitchens; with the addition of the San Francisco Unified account, it will have to produce at least 22,000 more lunches each day. Even for one of the nation’s fastest-growing companies, this will be a big lift for Revolution, but Ms. Tobey assured the Board the company can handle it. She said Revolution has already begun increasing refrigeration capacity and is alerting suppliers that their orders will be increasing as well. Revolution’s foods will start appearing in SFUSD cafeterias on Monday, Jan. 7, the first day of school following the Winter break (and it’s a good thing, too, as sources tell me there was no backup plan if the Board had turned down the contract). Talk about working without a (hair)net. Once they’ve had a week or so to settle in, let me know what you think!